And here we go again. 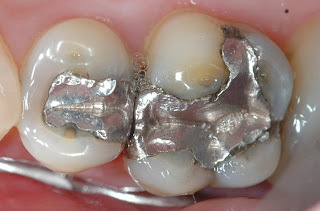 Dental amalgam is the most commonly used dental restorative material used for dental fillings. First introduced in France in the early 19th century, it contains a mixture of mercury with at least one other metal. Amalgam has been the restorative method of choice for many years due to its low cost, ease of application, strength, durability, and bacteriostatic effects. Factors that have led to recent decline in use are a lingering concern about detrimental health effects, aesthetics, and environmental pollution. The aesthetic issue is because the metallic colour does not blend with the natural tooth colour. This is especially a concern when used on front teeth, but it can be addressed using alternative dental materials. The environmental concerns are regarding mercury emissions during preparation and from waste amalgam upon cremation of deceased individuals. (Wikipedia). And below, you can download the presentation from my lecturer's during my graduate school.